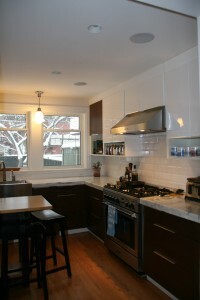 Main Renovations — Ottawa Home Renovations and Contractors – Kitchens! Sometime in the late eighties, some interior design guru implanted this concept of the â€œtriangleâ€ in peopleâ€™s brains; the idea that the main stations of the kitchen; the sink, the fridge and the stove must be located at each of the points of the triangle and that the total linear feet of this triangle should not exceed 21â€™. My theory is that this person was not in fact an interior designer but rather an engineer. Engineers, in my experience, should be barred from designing anything aside from bridges, engines and keg parties. To his or her credit, there was likely not more than one (woman) preparing/serving/clearing at any given time, so perhaps this militant distance and juxtaposition notion was not the worst idea ever, but times have changed and in this world of kitchens that double as living spaces and dinner parties involving such fanceries (new word, coined by yt) as dates wrapped in goat cheese and bacon, the kitchen is used for and by multiple family members, often at the same time, and so, we must design them as such. Step 1. Picture what actually happens when food is being prepared at mealtime. Not what you would like to see happen, but what actually happens. Perhaps your kids do their homework at the table and one spouse reads the paper. Or perhaps you prepare the food while someone else cleans up from lunch (or last nightâ€™s dinner â€“ no one is judging your habits here;). What you want to think about is how the space needs to serve everyoneâ€™s needs and mainly, how to stay out of each otherâ€™s way. Use station 1: Food prep: where does the food come from? The fridge? The pantry? Several different cupboards? Generally speaking you want all the food to be stored in one place. 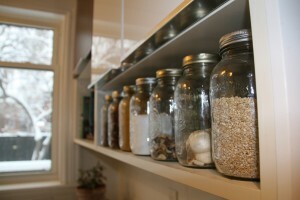 Exceptions to this would be spices and herbs, oils and vinegars; these items should be near the stove for quick access. The reason is this: once you have pulled out all the food to be prepared, there is no need to go back to that space again until it is time to put the food away â€“ ergo, it is a separate space. Use station 2: Preparing the food: Chopping and dicing and actual cooking are a second use station; preferably on either side of the stove or on an adjacent island and no more than three or four feet from a sink. This use-station should also incorporate garbage and compost containers. Use station 3: Eating/setting the table: I once knew this Dutch guy who actually had no dish-cupboards but instead had two dishwashers â€“ one for clean and one for dirty. (Will those Dutch ever have a bad idea?!). The reason is simple – dishware and cutlery have absolutely nothing to do with preparing food; Get them out of your way and out of the line of action. They should, however, be within close proximity to the sink and of course the dishwasher. 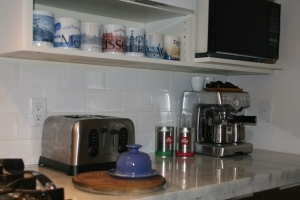 (Dishwashers and sinks are generally side by side, both for ease of plumbing install and basic sense). The same applies for things like recycling stations and the dreaded food storage container drawer. Once you have these use stations sorted out, you can better envision how everyone is going to work in the space; people who are setting the table or unloading the dishwasher are steering clear of the person cooking the food and people who are making their lunch are out of the way of the people who are washing the pots and pans. If you want to take it to a whole other level, start picturing coffee versus cereal stations â€“ in our house, for instance, Frank loves his espresso. He wants to stand next to his machine and lovingly tamp and press his morning elixir without being anywhere near the whirlwind of my lunch-making and the kids cereal-slopping. And so he has a 4th station: the coffee station. Remodeling your kitchen will likely be both the most fun and the most expensive reno you ever do, so blazing ahead without thinking things through can be both costly and frustrating. Hiring a designer to help you with the process is often wise, and can save you some money and headache in the long run. Whichever way you decide to proceed, donâ€™t get caught up in the finishes until you have the functionality sorted out â€“ tiles and countertops are the fun part, but resenting them for being in the wrong place is not. By Kathryn|2013-01-19T13:31:35+00:00January 19th, 2013|Kitchens|Comments Off on Kitchens!